After months of negotiations, a new law and a bit of good-old fashioned rallying, Tesla Motors is one step closer to coming back to New Jersey. Updated from 1:49 p.m. to include comments from CEO Musk in the third paragraph. NEW YORK (TheStreet) –– After months of negotiations, a new law and a bit of good-old fashioned rallying, Tesla Motors (TSLA - Get Report) is one step closer to coming back to New Jersey. After months of haggling with lawmakers, the New Jersey Coalition of Automotive Retailers lobbying organization and Gov. Chris Christie's office, the New Jersey State Assembly voted in favor to allow Tesla to resume selling cars directly to consumers in the Garden State. The Palo Alto, Calif.-based company was blocked from selling cars in the state directly to consumers earlier this year. All 77 members of the State Assembly voted in favor of it, with one abstention, according to Tesla. The bill now goes to to the New Jersey Senate. Though no official indication has been made whether the bill will pass the state's Senate, industry analysts expect it to pass without issue. If it's passed in the Senate, the bill will then be sent to Governor Christie for his signature. In an interview on CNBC on Tuesday, CEO Elon Musk said he "hopes" that the New Jersey Senate will pass the bill, and ultimately Gov. Christie will sign the bill into law. In March, the New Jersey Motor Vehicle Commission approved a law that prevented Tesla from selling directly to consumers via its two retail stores, one in Paramus and the other in Short Hills, citing a law that has been on record since the early 1900s that said that automotive companies like Ford (F - Get Report) and General Motors (GM - Get Report), could not sell directly to consumers. Tesla, which shipped 22,500 Model S units in 2013, has been lauded by consumer advocates for its method of selling that cuts out dealership middlemen, as it seeks to build awareness of the electric car market, as well as its products, which includes the Model S and the upcoming Model X, due out next year. Diarmuid O'Connell, Tesla's Vice President of Corporate and Business Development, stated that Tesla was pleased with the outcome of the vote. "Tesla is pleased that the New Jersey State Assembly has sent an overwhelming message of support for consumer freedom of choice and passed a bill that would once again allow the company to sell cars directly to consumers in the state," O'Connell said in a statement emailed to TheStreet. "We'd like to thank Assemblyman Timothy Eustace and Assembly Majority Leader Lou Greenwald, who put forth the bill, the 77 out of 80 legislators who voted in favor of it, and Tesla's supporters in the state for helping to further the cause of sustainable transport and uphold the principles of the free market. We look forward to working with state Senators to pass the bill through their chamber and send it to the Governor for his signature." The move allows Tesla to keep its delivery guidance for 2014, which some saw as being in jeopardy due to the closures in New Jersey and elsewhere around the country. When the company reported fourth-quarter earnings in February, Tesla said it expected to deliver 35,000 Model S units in 2014, up 55% year over year, as production "is expected to increase from 600 cars/week presently to about 1,000 cars/week by end of the year as we expand our factory capacity and address supplier bottlenecks." The company noted that battery cell supply will continue to be a constraint in the first half of 2014, but that will "improve significantly in the second half of 2014." For the first quarter, Tesla expects to produce about 7,400 Model S units, but will deliver approximately 6,400 vehicles in the first quarter due to bottlenecks in Europe and Asia. In March, Tesla said it's sold "several hundred cars" in New Jersey on a conference call, but declined to discuss the exact amount. Tesla also acheived a similar outcome in Ohio in March. Not only can Tesla sell directly to consumers in its two existing stores in Easton and Cincinnati, but it allows for Tesla to open a third store in Cleveland. 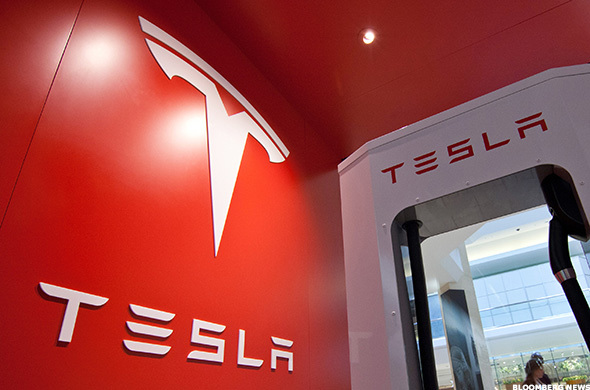 However the deal prohibits Tesla from opening any more stores in the state. As per the agreement, Tesla is the only automaker allowed to operate its own stores in the state. The New Jersey news comes one day after New York signed legislation allowing Tesla "to maintain their five currently licensed retail locations in New York State." The legislation also allows additional Tesla retail locations that "will be established under a strengthened dealer franchise law."